Susan Hallowell steps into a metal booth that bounces X-rays off her skin, producing a black-and-white image that reveals enough to produce a world-class blush. To the eye, she is dressed in a skirt and blazer in dark, businesslike colors. 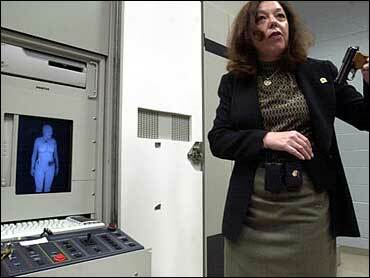 On the monitor, the director of the Transportation Security Administration's security laboratory is naked, except for a gun and a bomb that she had hidden under her outfit. The government is considering using the technology at airport security checkpoints because the magnetometers now in use cannot detect plastic weapons or substances used in explosives. Hallowell is sacrificing her modesty to make a point: Air travelers are not going to like being technologically undressed by security screeners. "It does basically make you look fat and naked - but you see all this stuff," Hallowell said Wednesday during a demonstration of the technology. The technology is called "backscatter" because it scatters X-rays. Doses of rays deflected off dense materials such as metal or plastic produce a darker image than those deflected off skin. The radiation dosage is about the same as sunshine, Hallowell said. Backscatter machines have been available on the market for years. They are priced at between $100,000 and $200,000 and used in all sorts of security situations, from screening families of convicts visiting prisons to South African diamond miners going home for the day. The agency is trying to find a way to modify the machines with an electronic fig leaf - programming that fuzzes out sensitive body parts or distorts the body so it is unrecognizable. Another option might mean stationing the screener in a booth so only he sees the image, said Randal Null, the agency's chief technology officer. Null hopes to conduct pilot programs with backscatter machines at several airports this year. A pilot project at Orlando International Airport in Florida using volunteers met with mixed results, he said. Some volunteers were uncomfortable with it. For others, "It was a whole lot nicer than having someone pat me down," he said. David Sobel, general counsel for the Electronic Privacy Information Center in Washington, thinks most people will object to the backscatter technology. "The public is willing to accept a certain amount of scrutiny at the airport, but there are clearly limits to the degree of invasion that is acceptable," Sobel said. "It's hard to understand why something this invasive is necessary." But Rep. John Mica, chairman of the House Transportation and Infrastructure subcommittee on aviation, thinks it is essential because of the strong likelihood that a terrorist will try to bomb a plane. "I predict it will happen," said Mica, R-Fla. "The chances of someone bringing an explosive on an aircraft by walking through a metal detector or in hand-carried luggage are very real." Mica pointed out that Richard Reid, convicted of trying to blow up a trans-Atlantic jetliner with explosives in his shoes, walked through metal detectors at Orly Airport in Paris several times before boarding the plane. Federal transportation security officials say a backscatter scanner could have foiled Reid. For now, Mica is trying to persuade colleagues to require that the transportation agency focus its research on technology that identifies items on people's bodies. Null said the agency's major focus is already on detecting explosives and weapons at airport checkpoints. In the end, the biggest problem with the backscatter machines may be their size, he said. One version, the BodySearch system made by Billerica, Mass.-based American Science & Engineering is about 4-feet by 7-feet by 10-feet - awfully big for an airport lobby, Null said. Another system made by Hawthorne, Calif.-based OSI Systems is more compact.